Green Parliamentary candidate Stuart Jeffery joined protesters outside Barclays in Canterbury as part of a national day of action to call on Barclays to end its investment in the company that supplies drones to Israel. Local CAAT activists demonstrated with support from the Whitstable and Faversham Palestine Solidarity Campaign handing out leaflets and asking people to sign a petition. Stuart Jeffery, Green Parliamentary Candidate for Canterbury and Whitstable: "I have added my voice to calls for Barclays to disinvest in Elbit Systems, the company that makes drones for Israel. These drones have killed over a thousand people in the disproportionate war by Israel against the Palestinians. 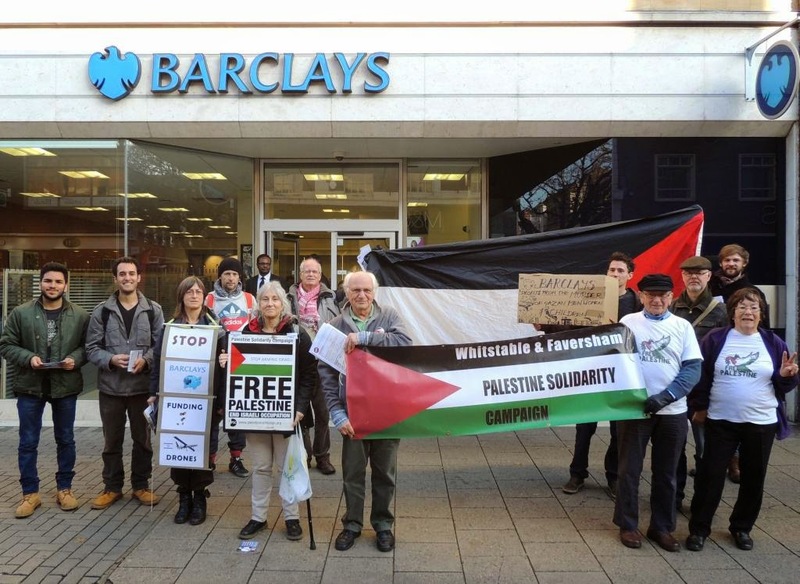 "I demonstrated outside Barclays in Canterbury alongside the local Campaign Against Arms Trade group and the Whitstable and Faversham Palestine Solidarity Campaign as part of a national day of action. "Barclays are a named investor in Elbit Systems with $2.9m of shares. 1.8 million people have signed a petition calling on Barclays to divest themselves of these shares. "The response from people was overwhelmingly positive and I was proud to help out and support this campaign."